I’ve just released the first in what I plan to be several Sanctum Shorts. They’re short stories about the people in the community of Sanctum, Caly and Evan’s local dungeon. In Are You Willing?, Evan leaves Caly a note with instructions on how to dress and how to be waiting for him when he arrives home. When they go to Sanctum that evening, Caly experiences her very first public dungeon scene. If you like suspension, crops, and knives, you’re gonna like this one! Even more fun than that (if you can imagine! 😉 ), is that Caly, as well as you, Dear Reader, meets several faces at Sanctum that she (and you!) will see again. Among them, Grace, a gorgeous black woman who bottoms to Sanctum’s current manager, Kevin. Also, Charlie, an older, pervy, gay Leatherman, and his boy Wuff. Well, Caly doesn’t actually meet them, but watches part of a very hot scene in the dungeon. And, of course, Miriam, who originally opened Sanctum with her master years before, and who has returned home to her tribe. Miriam’s Collar is the next book in the series and is scheduled to be published in late July! 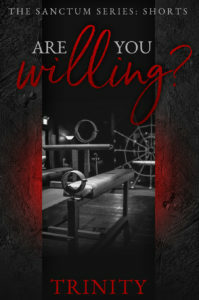 Are You Willing? is available at all the normal places. You can find links to all of them, as well as a short excerpt, here. Sanctums Shorts will be ebook only for now, but my plan is to collect them into volumes for print as there are more. Interested in a tour of Sanctum? That can be arranged! Check out my Linktree for links to ALL the interesting things!